If you take this tour you will really appreciate history well I hope you do. The ship was sadly in CT getting pampered but otherwise you can still see the Rock. Great city to stroll around.Many museums to visit. Out driver was great. Nice and knew her stuff. This tour was great. 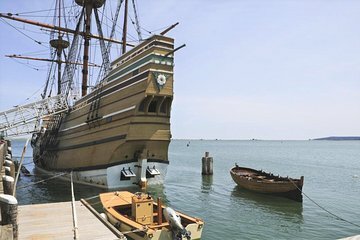 We were able to have enough time in Plimoth Plantation and then spend time in the town of Plymouth. Bob was our driver and he was amazing. The tour was an informative and entertaining way to visit America's Hometown. Ask for Sam he's great! Great day in spite of it being very rainy. Our driver Sam was fantastic and kept us entertained and educated along the way. Worth doing if you are a history enthusiast ! Sam-I-Am was a great tour guide..... very funny, very informative. Plymouth Plantation was great. The other stops were wonderful. Good tour. Don't spend too much time on lunch because time in Plymouth is limited. Excellent day even without the 'Mayflower'. The driver we had was great and we were given plenty of time at the Plimoth Plantation The Mayflower wasn't there but we went to the Plimoth Grist Mill instead which was interesting.